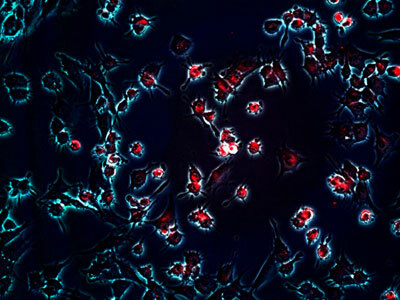 (Nanowerk News) The University of Central Florida’s (UCF) Institute for Simulation and Training, in collaboration with the UCF NanoScience Technology Center, recently hosted a workshop to explore data collection, analysis and modeling of nanoparticle and cell interactions for cancer research. Highlights of the October 11 workshop included prospects of using complexity sciences towards building computational models of nanoparticle, cell interactions by Ivan Garibay, director of the Complex Adaptive Systems Laboratory at the Institute and research information systems director at UCF’s Office of Research and Commercialization. Heiko Enderling of the Moffitt Cancer Center gave an introduction to agent-based models of cancer and Aniket Bhattacharya, associate professor of Physics at UCF, led a discussion about potential models for particle-cell interactions. UCF’s Institute for Simulation and Training (IST), in collaboration with the UCF NanoScience Technology Center, explore the potential impact of nanoparticles and cells in cancer research. Laurene Tetard of UCF’s NanoScience Technology Center discussed nanoparticle/cell interactions and Ozlem Garibay from UCF’s Office of Research and Commercialization examined funding opportunities and high-performance computing resources. Qun Huo and Alexander Balaeff of UCF’s NanoScience Technology Center discussed next steps for broader awareness in nanoparticle functionalization and multi-scale simulations in cancer research. “We view cancer as a complex biological system and recognize the potential in studying how nanoparticles and nano-robots could be engineered to affect these systems,” Garibay said. "The synergy at UCF is a perfect platform to create a strong, innovative and interdisciplinary program to advance cancer research,” Tetard said. Founded in 1982 as a research unit of UCF, IST is an internationally recognized research institute that focuses on advancing human-centered modeling and simulation technology and increasing our understanding of simulation's role in training and education. The institute in 2012 celebrated 30 years of M&S research achievement.